So, I wonder which came in first, my story-sensitive senses or my inner drive to write? I see stories everywhere. 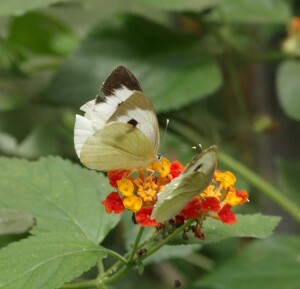 Just today, I saw a beautiful white butterfly landing on an orange lantana flower. I know, millions of butterflies visit billions of flowers daily, what makes this moment special? Well, for starters, I saw it. So, here is a story about a middle-aged woman. She is carrying heavy grocery bags, yet she stops to look at a butterfly. Why is she doing that, asks the author inside me, well, I reply, she knows that if she won’t stop to adore the butterfly it will fly away. She lives in the moment. Half an hour before the butterfly moment I was pushing a supermarket cart filled with groceries to my car when a man stumbled in my way. I caught just a glimpse of him. He was straightening up after getting pipe scraps from a cardboard box that someone threw by the side of the road. The man’s face was lit with pure joy, it looked like he found a treasure in those metal pieces. Then he turned and walked toward his wife which was standing in the parking lot. She was wearing a fancy dress. Not something you wear to a supermarket. And she didn’t look happy. I could see how skepticism crumbled her lovely face. She didn’t share her husband’s joyful moment. They exchanged words. I didn’t hear but I could guess by their gestures. she was saying, stop picking up garbage, and he replied excitingly , I’m looking for pipes like these for a long time now and finally I got them. Do you know what I’m going to do with that? Well, I don’t know, because I kept pushing the cart toward the car. Each day I get tons of stories just by paying attention to what’s around me. Sometimes I write them down, but most of the time I write them only in my head, enjoy them for a moment and then let them fly. Like that butterfly.